Sometimes you are the subject…. Being a student means I tend to be on the passive side of research for the most part. Reading it, writing it, occasionally designing and implementing, but never the actually subject. Unless you count first year psychology. There were many studies, surveys, word tasks, mostly boring and obvious. My experience as an object of study has been limited and dull, until last week. 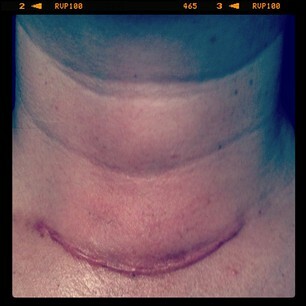 I had a procedure on my thyroid, which meant surgery, surgeons, hospitals, unflattering gowns, the whole lot. It was pretty routine as far as sugeries go, but unsettling and nerve wracking nonetheless. As I waited my turn to enter the operating room, I heard my surgeon talking to the patient who would go before me. He was discussing a clinical trial he was doing on a particular cream to reduce scarring at the incision site. He explained to the patient that they would be given either the standard of care or the new cream being tested. Shockingly, right then and there, he pulled out his iPhone, used an application to generate a number and then told the patient which group they were in. I was surprised that the surgeon himself would be doing this before the surgery. How would he know he wouldn’t be biased and unknowingly make certain incisions nicer than others. Didn’t he realize how intimidating he would be to a person sitting around in a hospital gown? Would anyone say “No” to the person who was about to cut them open and perform a very delicate operation on their neck? When it was my turn, I agreed to be in the trial. I tell myself now that I did it because I was curious to see what it would be like to be in a clinical trial and experience what it would be like to participate. But, when it comes down to it I don’t think i would have said “No” to him even if I wanted to. I had no shoes on, no clothes, captive to my IV, unable to go anywhere. And, this man was about to cut me open, I didn’t want to irritate him or displease him in any way. A few days later, the fog of anesthetic lifted and I read through the material he gave me regarding the study. Not only did he not follow protocol and create bias in the experiment, but the literature stated that patients in the control group (which would be me) were urged not to use any kind of anti-scarring creams or lotions to minimize their scar. This was not highlighted while the doctor was going over the terms of the study. I was not asked to read it, nor did he go over it in detail with me. This does not constitute informed consent. The scar I now have is quite obvious, right at the base of my throat. It is 8 centimetres (4 inches) long, bright red, and raised. I find it very disturbing that patients would be discouraged from minimizing such a mark on their body that is so apparent to others and makes me look at myself differently in the mirror now. I feel ugly, maimed, why wouldn’t I do something to make it better? Should I carry a bigger scar than needed in the name of science? The literature that I was given provided no information as to the governing body that approved this study. I am not meeting with my doctor for follow until early November and I am not sure I would feel comfortable discussing this with him. I will have to do some research and see if I can find out how to lodge a complaint about this study. Any comments or suggestions would be welcome. This whole experience has given me an entirely new perspective on clinical trials, why we have certain implementation policies for such procedures, and the experience of patients. I will always wonder if my surgeon took due care in creating and closing my incision. I will always wonder what my scar would look like had I been given the experimental treatment. I will never read a clinical trial again without thinking about the actual people who participated and what their experience must have been like. UPDATE: I just called the doctor’s office. I blocked my number as I still have follow up appointments with this doctor and did not want them to know who I was. The receptionist was not helpful and would not give me the name of the ethics or review board that would be responsible for overseeing this study. She offered to pull my chart and have one of the assistant researchers speak to me. I found a reference to the UBC Research Ethics Board and now have a number of someone to speak to there. I noticed that the literature I was given about the study was from 2009, so it must be study that has been going on for a while. Perhaps I am overreacting a little, but I genuinely feel that the way this study is being done bullies patients into participating and creates true and concerning bias. This entry was posted in Blog Reflections by thughesa. Bookmark the permalink.